Do It London is an award-winning public health initiative set up in 2015 by London’s boroughs in response to high rates of HIV. The capital is home to an estimated 38,700 living with HIV – accounting for 43 per cent of all people with the condition in England. Lack of awareness, late diagnosis, and continuing stigma all increase the risk of onward transmission and poorer health outcomes. Since Do It London began there has been a downward trend in the number of people diagnosed with HIV in the capital, despite more people testing. This includes a remarkable 40 per cent reduction in HIV diagnoses in five central London clinics – a reduction that has not occurred on the same scale in the rest of the country. Earlier in 2018, London joined the worldwide Fast-Track Cities initiative and became one of the first global cities to meet the UN’s ambitious HIV diagnosis and treatment targets. Working together with other cities, London has pledged to achieve three key HIV goals by 2030: zero new transmissions, zero deaths, and zero stigma. Do It London is the largest campaign for driving progress towards these ambitious goals in the city. If current trends continue, London can be confident of achieving them within the next decade. London boroughs have launched the campaign to encourage Londoners to look after their sexual health and prevent HIV transmission. The campaign aims to raise awareness of the multiple options now available for stopping HIV. 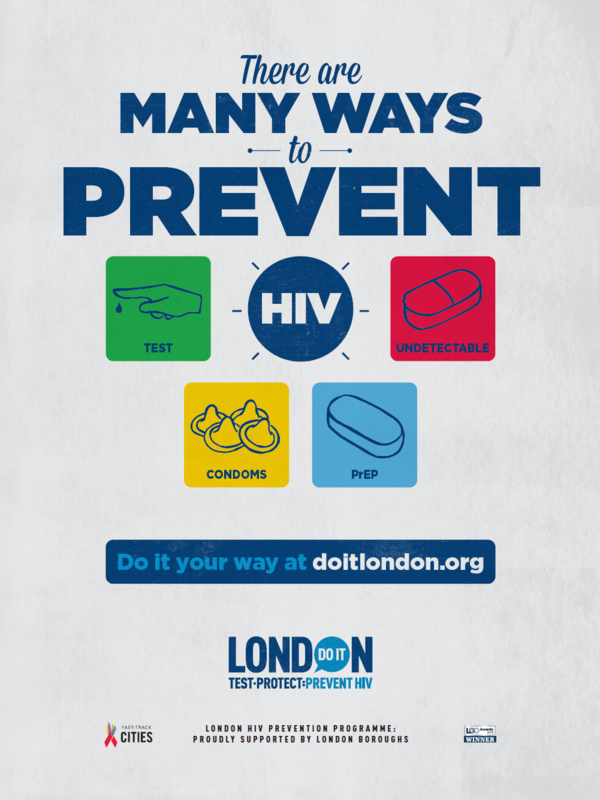 Led by public health experts at the London HIV Prevention Programme, which is facilitated by London Councils, the campaign encourages Londoners to use Pre-Exposure Prophylaxis (PrEP), alongside condoms and regular testing, as core HIV prevention methods. It also emphasises that someone with diagnosed HIV who achieves an ‘undetectable’ status cannot pass the virus on to their sexual partner. Supported by a dedicated website, doitlondon.org signposts to further information and services, the pan-London publicity will run across a range of outdoor and digital channels, as well as through on-the-ground outreach and condom distribution teams, including at the iconic London Pride event and at other events in summer and autumn in 2018.